The blood-brain barrier (BBB) protects the brain by preventing the entry of largemolecules; this poses a major obstacle for the delivery of drugs to the brain. Anovel technique using focused ultrasound (FUS) energy combined with microbubblecontrast agents has been widely used for non-invasive trans-cranial BBB opening.Traditionally, FUS research is conducted with magnetic resonance imaging (MRI)guidance, which is expensive and poses physical limitations due to the magneticfield. A system that could allow researchers to test brain therapies without MRintervention could facilitate and accelerate translational research. In this study, we present a novel FUS system that uses a custom-built FUSgenerator mounted on a motorized stereotaxic apparatus with embedded brain atlasto locally open the BBB in rodents. The system was initially characterized using atissue-mimicking phantom. Rodent studies were also performed to evaluate whethernon-invasive, localized BBB opening could be achieved using brain atlas-basedtargeting. Brains were exposed to pulsed focused ultrasound energy at1.06 MHz in rats and 3.23 MHz in mice, with the focal pressure estimatedto be 0.5–0.6 MPa through the skull. BBB opening was confirmed in grosstissue sections by the presence of Evans blue leakage in the exposed region of thebrain and by histological assessment. The targeting accuracy of the stereotaxic system was better than 0.5 mm inthe tissue-mimicking phantom. Reproducible localized BBB opening was verified withEvans blue dye leakage in 32/33 rats and had a targeting accuracy of±0.3 mm. The use of higher frequency exposures in mice enabled a similarprecision of localized BBB opening as was observed with the low frequency in therat model. With this dedicated small-animal motorized stereotaxic-FUS system, we achievedaccurate targeting of focused ultrasound exposures in the brain for non-invasiveopening of the BBB. This system can be used as an alternative to MR-guided FUS andoffers researchers the ability to perform efficient studies (30 min perexperiment including preparation) at a reduced cost in a conventional laboratoryenvironment. For most therapeutic agents aimed at treating central nervous system (CNS) diseases anddisorders, the blood-brain barrier (BBB) is a primary physiological barrier limitingdrug delivery into the brain parenchyma. The BBB is a separation present along allcapillaries in the CNS that controls the molecular transport and diffusion across theseblood vessels. The barrier is formed by layers of cells that are coupled by tightjunctions [1, 2]. Only small-molecule drugs with high lipid solubility and a low molecularmass under 400–500 Da can cross the BBB in pharmacologically significantamounts, hence excluding most current therapeutic and imaged agents from being used inthe brain [3, 4]. Non-invasive localized opening of the BBB has been demonstrated using focused ultrasound(FUS) exposures combined with circulating intravascular microbubble ultrasound contrastagents. The exact physical mechanisms governing the interactions between themicrobubbles and endothelial cells are not known, but it is likely that when stimulatedby ultrasound energy, oscillation of microbubbles produces mechanical effects induced byradiation force and/or shear stress on the blood vessel walls, temporarily opening theBBB without tissue damage –. This combination of FUS and intravascular microbubbles offers a uniquemethod for remotely actuating mechanical energy at the site of small vessels throughoutthe brain. Meanwhile, this opening occurs at lower acoustic power levels than waspreviously used without intravenous microbubbles, which makes this method substantiallyeasier to apply through the intact skull . As early as 2001, Hynynen et al. demonstrated that focused ultrasoundcombined with gas bubbles can open the BBB transiently in rabbits . In 2002, Mesiwala et al. confirmed that high-intensity focused ultrasound iscapable of a selective and non-destructive disruption of the BBB in rats . Subsequent studies confirmed the feasibility of non-invasive localized BBBopening in rodents as models of human disease [11, 12, 1, 13]–. 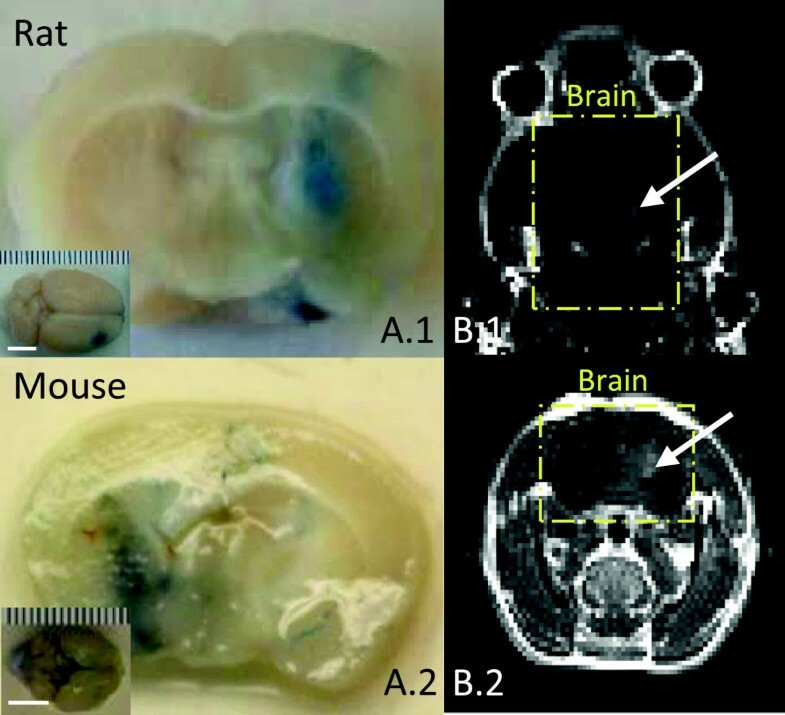 However, the small size of rodent brains makes FUS experiments challenging,necessitating the development of dedicated small-animal exposure systems . In the majority of studies to date, confirmation and visualization of BBB opening hasbeen achieved using magnetic resonance imaging (MRI). T1-weighted imaging is often usedto confirm successful delivery of gadolinium-based MR contrast agents across the BBB,and T2-weighted imaging can evaluate the presence of tissue damage [18, 19]. The major drawbacks of MR-guided FUS are the need for MRI-compatiblesystems, lack of availability, limited throughput of experiments, and expense. MR-guidedfocused ultrasound systems are not usually accessible to neuroscientists or otherresearchers outside of the imaging research field. A method for performing trans-cranialBBB opening without MR guidance would be desirable in order to lower the barrier toentry in this field and to achieve broader penetration of FUS technology inneuroscience. Previous studies have incorporated systems for BBB opening outside the MRI environment.One method for targeting specific regions in the brain is the use of stereotaxy incombination with an anatomical atlas. This method is widely used in neuroscience to theinjection of agents or implantation of electrodes in specific regions of the rodentbrain. Liu et al. 's group developed a pinhole-assisted mechanical scanning device usinga stereotaxic apparatus for BBB opening , and Konofagou et al. applied a stereotaxic frame for localized BBB openingin rodents . Another method for imaging BBB opening is multi-photon fluorescencemicroscopy. The two-photon microscopy allows in vivo visualization of thecerebral vasculature and neurons at the subcellular level . Besides, cerebrovascular dynamics and kinetics of dye leakage after FUSsonication can also be imaging with multi-photon microscopy . However, in order to enable targeting of the ultrasound focus to a specificfunctional area in the brain, MR images are still required in these systems. In this study, we present a compact stereotaxic-FUS system to perform trans-craniallocalized BBB opening in rodent models using FUS energy and a stereotaxic system with abuilt-in rodent brain atlas. The goal of this system is to provide a tool forneuroscientists to achieve non-invasive targeted BBB opening in rodents for behavioraland functional research. Using the rodent brain atlas, researchers can easily target aspecific functional area of the brain. In this paper, we introduce our stereotaxic-FUSsystem, followed by initial accuracy characterization in tissue-mimicking phantoms androdents. Successful BBB opening was confirmed through gross imaging, histopathology, andMR imaging. By all forms of measure, repeatable non-invasive localized BBB opening byour rodent stereotaxic-FUS system was verified. Ultrasound was transmitted into the brain using a focused transducer with a 25-mmdiameter and a 20-mm radius of curvature. The fundamental frequency of the transducerwas 1.06 MHz, and the third harmonic frequency was 3.23 MHz, as measuredwith an impedance analyzer (Via Bravo, AEA Technology Inc., Carlsbad, CA, USA). Thedimensions of the ultrasound focus and the pressure output of the transducer werecharacterized using an acoustic hydrophone tank. A needle hydrophone with a 0.2-mmactive area (HGL-0200, Onda Corporation, Sunnyvale, CA, USA) was scanned in threedimensions to measure the spatial pressure distribution of the ultrasound beam at thefocus for each transmission frequency. The transducers were connected to a custom-built compact driving system comprised ofan arbitrary waveform generator (LMS271D, Vanuix Corp., Haverhill, MA, USA), an RFamplifier (NP Technologies, Newbury Park, CA, USA), high-power low-pass filters, anda dual-frequency matching circuit that enabled efficient transmission of power to thetransducer at each operating frequency. This self-contained driving system wascontrolled from a laptop computer via USB. One of the main goals was to produce aportable system for focused ultrasound that could be easily transported forexperiments. A standard stereotaxic apparatus (51730 M, Stoelting Co., Wood Dale, IL, USA)was used to achieve targeting of ultrasound energy within the brain with anattachment capable of registering the rat brain atlas (Neurostar, Tubingen, Germany).These systems are normally used to achieve precise insertion of electrodes orinjection of materials directly into target regions of the brain. 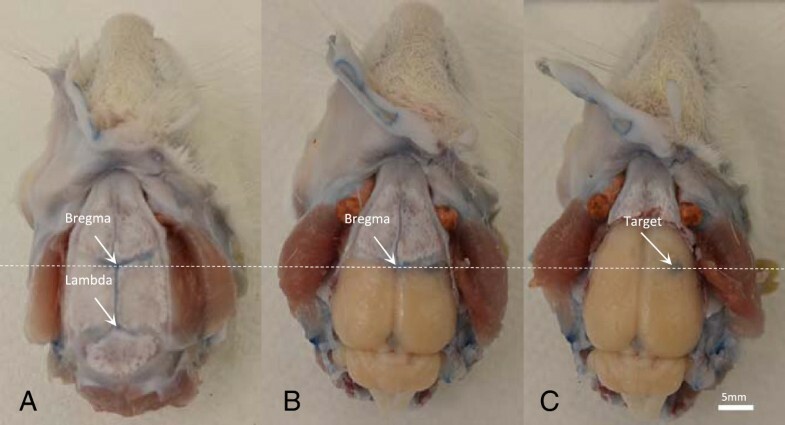 The method ofregistering the brain atlas to the rodent involves locating the bregma and lambda onthe rodent skull sutures with a metal pointer. Once the x, y, andz coordinates of these two locations are identified, the brain atlas(which is referenced to these points) is immediately registered to the animal.Tilting correction was performed automatically based on the current animal to takethe difference in brain position and size into consideration. In order to test the spatial accuracy of ultrasound delivery using thestereotaxic-FUS system, a series of exposures were performed in a custom-madetissue-mimicking phantom. The phantom was comprised of a hydrogel with dissolvedbovine serum albumin (BSA), similar to previous recipes , which could be used to capture the location of the ultrasound focusthrough coagulation of the BSA. Briefly, gellan gum (1% w/v,Gelrite, CP Kelco, Atlanta, GA, USA) and salt (0.23% w/v)were added to and dissolved in deionized, degassed water(90% v/v). Metamucil (0.18% w/v,P&G, Cincinnati, OH, USA) was added to the mixture to create ultrasoundscattering. BSA (25% v/v, CF-0020, Boval, Cleburne, TX, USA)was dissolved in the gel to provide ultrasound absorption. BSA also provides anoptical marker of the ultrasound focus since the protein undergoes coagulation whenheated above 70°C and creates a visible region of opacity within the otherwisetransparent gel. The heating of the gel was achieved using a continuous delivery ofultrasound at the high third harmonic frequency (3.23 MHz). The recipe for thetissue-mimicking phantom is shown in Table 1. The speed ofsound and ultrasound attenuation coefficient of the phantom material werecharacterized using a hydrophone tank and were measured to be1,518 ± 2 m/s and 0.3 ± 0.1 dB/cm (at1 MHz), respectively. The spatial accuracy of ultrasound delivery was evaluated by exposing targets withdifferent spacing (0.5, 1, 1.5, and 2 mm) in all three directions (x,y, z). The tissue-mimicking phantom was placed in the positionwhere the rodent head would be located, and the ultrasound transducer was coupled toit using degassed water. After the exposures, the distance between the regions ofcoagulation in the gel were measured and compared with the desired separation. Testswere completed in two planes (x-y and x-z). Foreach plane, one reference target (A) and four testing targets (B, C, D, E) wereselected to apply the sonication. As an important next step, ultrasound exposures were delivered to thetissue-mimicking phantom in a three-dimensional (3D) pattern based on the rat brainatlas in order to cover a spatial region equivalent to the right motor cortex of thebrain. The geometric fidelity of this ultrasound exposure was evaluated in comparisonto the brain atlas. Female 200–270-g Sprague Dawley rats (n = 56) andfemale 20–25-g Swiss Webster mice (n = 14) were used inthis study. All procedures were approved by UT Southwestern Institutional AnimalCare and Use Committee and followed guidelines set forth by the Guide. Animalswere anesthetized with a mixture of 2%–3.5% isoflurane and1–2 l/min of 100% oxygen. A 24G I.V. catheter was placed in the lateraltail vein. A pulse oximeter was attached to the animal's paw to monitor heart rateand oxygen saturation, and a rectal temperature probe (attached to a homeothermiccontrol blanket) was used to record and maintain core body temperature(PhysioSuite, Kent Scientific Corp., Torrington, CT, USA). Hair over the cranialsurface of the skull was removed using an animal trimmer and depilatory cream(VEET sensitive formula, Reckitt Benckiser, Parsippany, NJ, USA). Afterpreparation, the animal was transferred to the stereotaxic apparatus andstabilized using ear bars and bite bar. A custom-built nose cone was placed overthe animal's nose to deliver inhalant anesthetic. In order to perform brain atlasregistration, a skin incision over the skull was performed to identify craniallandmarks bregma and lambda. 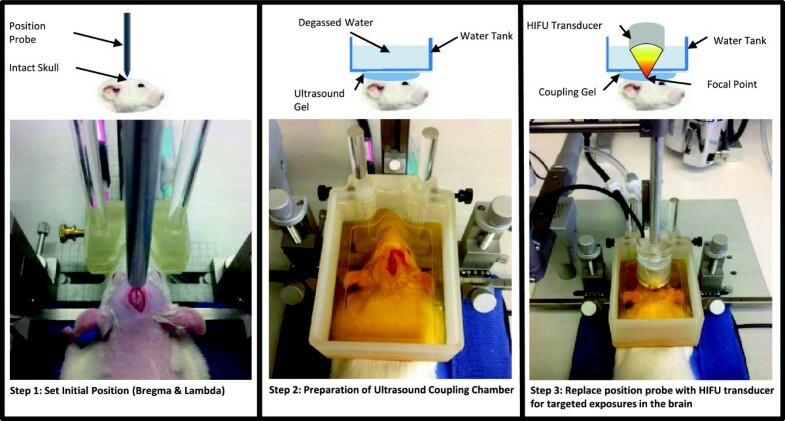 Ultrasound gel was applied on the skull, and acustom-built water reservoir filled with degassed water was lowered over the skullfor ultrasound gel coupling. The ultrasound probe was mounted on the stereotaxicsystem followed by target selection from the brain atlas. The ultrasound probe wasthen automatically moved to the targeted area to generate a focus at the specificlocation. This setup procedure is described in Figure 1. Overview of the procedure used to perform trans-cranial ultrasoundexposures using a standard stereotaxic positioning system. Step 1: Askin incision is made to expose the skull surface, and a metal pointer isused to locate the bregma and lambda sutures. Step 2: An ultrasound couplingchamber is placed over the skull with a thin layer of ultrasound gel betweenthe chamber and skull. The chamber is filled with degassed water. Step 3:The metal pointer is replaced with a focused ultrasound transducer whosefocus is now aligned with bregma. The rat brain atlas is used to determinethe appropriate distance to move the ultrasound focus to a targeted regionin the brain. Evans blue (2%; 3 ml/kg rats, 4 ml/kg mice) was injected via the tailvein catheter and allowed to circulate for a minimum of 1–3 min. Abolus injection of microbubbles (30 μl/kg rats, 60 μl/kg mice,Optison, GE Healthcare, Milwaukee, WI, USA) was delivered via the tail veincatheter, with simultaneous start of ultrasound sonication. When multiplesonications were performed (in the same animal), 5 min of wait time wasapplied to allow microbubbles to clear from circulation. All brain targets were selected in the right hemisphere (center of caudoputamen)while the left hemisphere was kept as a control. Twenty-three rats were utilizedto optimize FUS parameters (frequency, microbubble dosage, focal pressure, etc. )on BBB opening results. After optimization, 33 rats were utilized to verify thereliability of the system and to characterize spatial accuracy. Among those rats,5 were utilized for histology. Nineteen mice were utilized to optimize ultrasoundfrequencies specific to mouse cranial space and parietal bone thickness (7 for lowfrequency, 1.06 MHz, and 12 for high frequency, 3.23 MHz). Animals were sacrificed and perfused 5–10 min after sonication withsterile saline and 10% buffered formalin, followed by immediate harvesting of thebrain. Brain samples were then placed in 10% buffered formalin to allow for24–48 h of fixation time. Brains were sliced using a rat or mouse brainmatrix (World Precision Instrument, Sarasota, FL, USA) to confirm localization ofEvans blue leakage following BBB opening. Photographic record of Evans blueleakage was made, and a subset of subgross slices was worked up by histology. Subgross coronal brain-matrix slices from perfusion-fixed animals were paraffinprocessed, embedded, and sectioned according to standard procedures [24, 25]. Serial paraffin sections were prepared at the epicenter ofFUS-mediated hemorrhage, seen by dark-field microscopy . 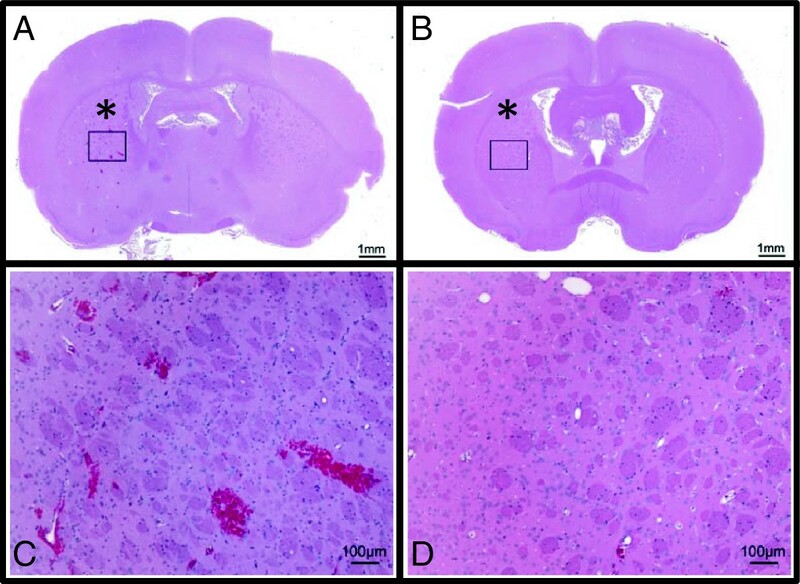 Resulting sections were stained by hematoxylin and eosin (H&E) andterminal deoxynucleotidyltransferase-mediated UTP end labeling (TUNEL).H&E-stained sections were analyzed for histopathologic hallmarks of braininjury (hemorrhage, edema, nuclear condensation, inflammatory cell infiltrate,rarefaction). Histologic analysis for possible ultrasound damage to neuronal andglial cell populations in the FUS target area was performed via TUNEL; nuclei ofapoptotic and necrotic cells were labeled with fluorescein according to methods ofthe first report . Sections subjected to TUNEL were counterstained with propidiumiodide. Single-frequency pulsed exposures (10-ms burst duration) were transmitted into thebrain with a repetition frequency of 1 Hz and a total exposure duration of120 s. In rats, the intracranial peak negative pressure at the focal pointunder low frequency (1.06 MHz) was adjusted to be between 0.5 and0.6 MPa, based on the hydrophone calibration of the transducer and publishedmeasurements of the insertion loss through rat parietal bone . Similar opening is expected with lower pressure. The threshold for theBBB opening was estimated to be inversely proportional to the square root offrequency . Prior studies have investigated extensively the effects of differentsonication parameters on the threshold of BBB opening : frequency , pulse width [31, 32], pulse repetition time , total sonication duration , microbubble size , and contrast agent dose [35, 36]. The ultrasound exposure parameters selected for this study have beenshown to achieve consistent opening of the BBB in rodent models . For the mouse exposures, a 3.23-MHz frequency was used instead of1.06 MHz in order to achieve a relatively localized ablation within the mousebrain. Skull insertion loss under high frequency is still unknown, so it wasassumed to be approximately 50% based on the skull thickness. The focusedultrasound energy was adjusted to achieve a focal pressure of0.5–0.6 MPa accordingly. Evans blue dye has been used frequently as an indicator of BBB opening. Evans bluebinds to albumin which cannot cross the BBB; therefore, neural tissue remainsunstained after intravenous administration of the dye . In these experiments, BBB opening was confirmed on gross tissuesections based on the leakage of Evans blue dye in the targeted area of thebrain. As a secondary validation, two rats that received ultrasound exposures to open theBBB in a targeted region were administered an intravenous injection of gadodiamide(0.02 mmol/kg, Omniscan, GE Healthcare, Milwaukee, WI, USA) and were imagedin a 9.4 T animal imaging and spectroscopy system (Avance, Varian MedicalSystems, Palo Alto, CA, USA). Contrast-enhanced T1-weighted spin-echo MR imageswere obtained to visualize BBB opening through diffusion of the contrast agentinto the brain parenchyma (field of view 128 × 128, TR/TE151/10 ms, slice thickness 1 mm, gap 0 mm, echo number 1). The spatial targeting accuracy of the system was evaluated through localization ofthe region of Evans blue staining on gross sections. Two specific targets weremanually selected using the brain atlas, and the spacing between targets wasmeasured on the gross sections. Atlas spacing was compared with measured spacingin three axes: anterior-posterior (AP), medial-lateral (ML), and superior-inferior(SI). Reference in ML and SI axes is the midline of the brain and top surface ofthe brain, respectively. For characterization of the AP axis, a reference pointwas selected as coordinates 0.00, 3.32, and 5.55 mm (AP, ML, and SI) relativeto bregma since the cranial landmarks disappear after removal of the skull. Fiverats were utilized to characterize targeting accuracy along each axis. The spatial pressure distribution produced by the focused ultrasound transducer,driven at the fundamental and the third harmonic frequency, was characterized in anacoustic hydrophone tank. The pressure distributions are shown in Figure 2 as a 3D map of the ultrasound beam. The scan was completed inplanes of 6 × 10 mm2 along (x-z,y-z) and 6 × 6 mm2 transverse(x-y) to the beam to cover the entire focal area. Two sidelobesalong the x direction were caused by electrode tabs on the transducer. Theultrasound transducer was excited with a 20-cycle pulse (40 cycles at the thirdharmonic frequency) and 100-Hz repetition frequency signal. The pressure at eachlocation was acquired as an average of 256 pulses. The full width at half maximum(FWHM) of the beam was measured to be1.6 × 2 × 10 ± 0.1 mm(x × y × z) for thefundamental frequency and0.4 × 0.6 × 3 ± 0.1 mm(x × y × z) for thethird harmonic frequency. The beam volume is approximately 0.0336 and0.00072 cm3, respectively. At higher frequency, the focal area isabout 46 times more compact. The pressure profile along each axis (x,y, z) is shown in Figure 2. The peaknegative pressure at the focal point ranged from 0.1 to 0.8 MPa at thefundamental frequency and from 0.05 to 1.2 MPa at the third harmonicfrequency. The ultrasound beam plots. (A, B) 3D beam plots for the fundamental andthe third harmonic frequency, respectively. At the third harmonic frequency,the focal area is more compact with higher intensity. (C-E) Intensityprofiles in three directions (x, y, z) for the twofrequencies. The peak amplitude could reach 0.25 V at the fundamentalfrequency (red curve) while 0.38 V at the third harmonicfrequency (blue curve). Figure 3 shows a sample pattern of coagulated volumesgenerated in the tissue-mimicking phantom. The desired separation and measuredseparation for each target are included in Table 2. In thex and y axes, the precision of targeting was approximately0.01 mm for four different separations. However, in the z axis, themeasured spacing was smaller than the desired spacing by up to 2%. This was likelydue to the difference in ultrasound attenuation and sound velocities between thephantom and water. Isolated regions of coagulated BSA within the phantom caused by focalheating with the 3.23-MHz transducer. The test was performed in thex‒z direction (left) and thex‒y direction (right) to measure theseparation between individual sonications. The precision of targeting wasapproximately 0.01 mm, and the accuracy was less than 2%. The greatesterror occurred in the z direction which is due to the difference inspeed of sound between the coupling water and phantom and the different amountsof each in the beam path with different focal depths. Figure 4 shows the results obtained for generating a 3Dultrasound exposure pattern that overlapped with the rat brain right motor cortex.The dimension of the motor cortex model was measured to be8.4 × 2.84 × 5.17 mm(L × H × W), with123.34-mm3 volume. The dimension of the phantom coagulation wasmeasured to be8 × 3.4 × 4.6 ± 0.1 mm(L × H × W), with125.12 (117.315 ~ 133.245)-mm3 volume. The percentage error ofpattern volume was within ±10% (-4.88% ~ 8.03%). Results obtained for generating a 3D ultrasound exposure pattern. (A) A3D rendering of the right motor cortex (red) and the brain(yellow), segmented from the standard rat brain atlas. (B)Views of the motor cortex from each of the three principal axes. (C) Thecorresponding pattern of coagulated BSA in the gel phantom along the same viewsand spatial scale. The 3D pattern of coagulation in the gel phantom wasequivalent to the shape of the motor cortex, and the volume was within 10%. Evidence of successful and confined BBB opening following FUS was observed by bothEvans blue dye leakage and contrast-enhanced MR images in the targeted brain area.Figure 5(A.1) shows the whole brain and targetedbrain slice for rat, under low-frequency (1.06 MHz) sonication. Evans bluedye can be observed on the cortical brain surface and in the correspondingunderlying slice, indicating the location of BBB opening. On the other hand, whenlow frequency was also applied in mice for comparison, Evans blue dye leakage wasobserved through the entire targeted hemisphere, likely due to the thinnerparietal bone. In order to achieve a similar tight focus, high frequency(3.23 MHz) was applied in the mouse model. Figure 5(A.2) shows the BBB opening results for mouse. In both the rat andmouse models, the un-targeted hemisphere presents as control. Figure 5(B) renders the T1-weighted MR images acquired as secondaryvalidation. B.1 refers to a transverse slice while B.2 refers to a coronal slice.The presence of an increased signal in the brain due to extravasation of thecontrast agent indicates localized BBB opening. Validation with the animal model. Evans blue dye leakage served asprimary validation. A.1/A.2 shows BBB opening on therat/mouse separately. A photo of the entire brain is referred at the corner;bar is 5 mm. T1‒weighted spin‒echomulti‒slice MR images (TR/TE, 151/10 ms) were acquired with ratas secondary validation. B.1 and B.2 show images intransverse and coronal directions, respectively. Yellow rectanglehighlighted the brain, and contrast enhancement (white arrow)indicates localized BBB opening. The system's spatial accuracy relative to the brain atlas was characterized inthree axes: anterior/posterior (AP), medial/lateral (ML), and superior/inferior(SI). Figure 6 shows a stepwise overview of brainregistry as the calvarium was removed. Photos were taken before and after removingthe calvarium to indicate the location of bregma and the reference point.Validation results in three axes are included in Table 2. Atlas spacing was acquired from the brain atlas during the targetingprocedure. Measured spacing was acquired from the brain slice after dissection,relative to references. The location of each exposure was manually selected to beat the centroid of the focal area. Percentage error was calculated based onaverage measured spacing and atlas spacing. Percentage error for targeting isestimated to be around ±5%. Overview of the dissection procedure applied to verify the accuracy ofthe reference target. The location of the reference target is (0,3.32, 5.55), measured based on bregma. Brain suture and landmarks are shownin (A), whole brain with the skull removed is shown in (C),and (B) serves as an in‒between photo. White dash lineperforms as an indicator of bregma. As further validation of the rat model, detailed histologic analysis was performedon coronal-matrix slices collected immediately following FUS and 72 hpost-FUS exposure. Figure 7 shows ultrasound-inducedBBB opening by routine histopathology. H&Es of acute and 72-h brains both showevidence of perivascular hemorrhage in the target region. Hemorrhage was limitedto the target area in both lateral-medial and anterior-posterior axes. Mildperivascular edema and condensation of adjacent neuronal nuclei was sparselyevident. Low-magnification images illustrate the contralateral hemisphere withouthemorrhage. In the absence of major histopathology on H&E in FUS rat brains,TUNEL was performed to look for apoptotic and/or necrotic vascular endothelium andthe surrounding brain parenchyma. No cells with nicked DNA were detected in thebrains from either acute or 72-h post-FUS rats (Figure 8). Images of juvenile mouse thymus TUNEL-positive control are includedin the figure for contrast to the autofluorescence of extravascular RBCs presentin FUS brain sections. H&E-stained sections for acute (A, C) and 72‒h recovery (B, D)rats. Both rats received the same ultrasound exposures in the samelocation in the brain, indicated by an asterisk. Low-magnificationimages of the entire brain section (A, B) depict the exposed and controlhemispheres. A cutting artifact is observed in (A) on the right corticalregion and is unrelated to the ultrasound exposure. A × 10magnified region (inset in A and B) depicts the cellular architecture in theexposed regions of the brain. Evidence of perivascular hemorrhage in thetarget region can be observed in the acute exposure. Tissue sections stained with propidium iodide ( red ) and TUNEL ( green ) for acute (A)and 72-h recovery (B) rats. The sections were taken from the sameregions of the brain as are shown in Figure 7C,D.The absence of green staining in the acute and recovery rats demonstratesthat no cells with nicked DNA were present in these regions. An image ofjuvenile mouse thymus TUNEL-positive control (C) is included at thesame magnification for contrast to the slight green autofluorescence ofextravascular red blood cells present in the brain sections exposed toultrasound. This study presented a novel system that interfaces a stereotaxic brain atlas and a FUSenergy transducer to achieve non-invasive localized BBB opening in rodents, without MRintervention. The spatial accuracy of the system was estimated to be ±2% with thetissue-mimicking phantom and ±5% with the rodent models. Evans blue dye leakage wasused as a subgross indicator of localized BBB opening, which was subsequently validatedby intact animal MR imaging of gadolinium contrast agent. Applying low frequency(1.06 MHz) and high frequency (3.23 MHz) on rats and mice, respectively, atight three-dimensional focus of ultrasound was achieved. This portable system can beused for rodents' BBB opening in a traditional laboratory environment. The primary research application we envision for this system is for the targeting ofregions within the rodent brain to facilitate functional neuroscience studies inrodents. Since the majority of these investigations are conducted in conventionallaboratory environments in close proximity to behavioral testing facilities, a portableFUS system that does not require MRI targeting and guidance is desirable. Furthermore,the brain atlas is an important targeting tool for functional regions of the brain inrodents. To our knowledge, this is the first study to explore the use of high-frequency FUSexposures in mice for BBB opening. Exposure of the mouse brain at 1.06 MHz resultedin a very large region of BBB opening in the brain encompassing the entire AP directionwithin a hemisphere. This is due to the thinner parietal bone and smaller brain size inmice. Exposures at 3.23 MHz achieved a localized region of BBB opening similar inproportion to the brain as was achieved using 1.06 MHz in rats. However, unlikeexperiments with the rat model, the skull insertion loss is still unknown at this highfrequency, and the focal pressure inside the mouse brain was estimated for this studybased on prior measurements at a lower frequency in the rat skull . Experimental measurement of the insertion loss through the mouse skull boneat 3 MHz is necessary to obtain more accurate estimates of the intracranialpressure amplitudes during these exposures. The system described in this manuscript still suffers from a few limitations. In orderto achieve BBB opening within a larger region of the brain, rapid mechanical  or electronic  steering of the ultrasound focus is desirable. The stereotaxic systemdescribed in this study is amenable to these technical improvements, and this additionwould enable regional opening of target structures within the brain. 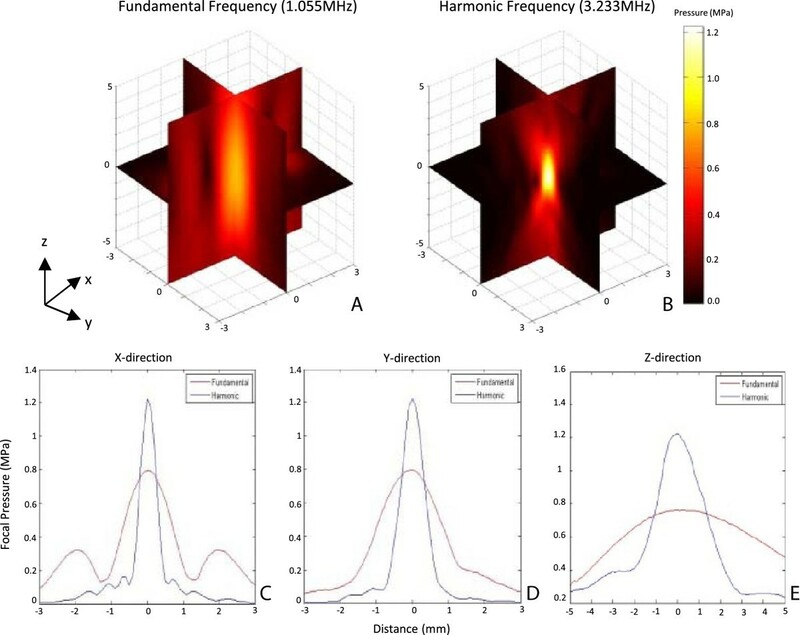 The incorporationof acoustic feedback has been demonstrated to achieve more consistent stable cavitationduring ultrasound exposures for BBB opening [40, 41]. Due to the lack of imaging confirmation of BBB opening with the stereotaxicsystem, this type of feedback would be an important improvement to the FUS system.Another limitation of this approach is that an incision is needed to identify bregma andlambda. Potential strategies to overcome this would be to use the external ear bars as areference point or to use a technique like high-frequency ultrasound imaging tonon-invasively locate the appropriate stereotactic reference point on the skull. Theseapproaches will be the subject of future investigations. Nonetheless, while theseimprovements would expand the capabilities of the existing system, the currentconfiguration is still capable of consistent opening of the BBB in rodents. A novel system that interfaces a stereotaxic brain atlas and a FUS transducer fornon-invasive targeted BBB opening in rodents is presented in this study. The spatialtargeting accuracy of the system was estimated to be ±2% in tissue-mimickingphantoms and ±5% in the rat brain. Localized opening of the BBB was achieved at1.06 MHz in rats and 3.23 MHz in mice. Consistent opening of the BBB wasverified through Evans blue staining in gross brain sections and histopathology inH&E-stained tissue sections. TUNEL staining confirmed that there was minimal to noapoptosis nor necrosis in the exposed regions of the brain. This study was conducted with the financial support from the Cancer Prevention &Research Initiative of Texas (Grant No. R1308) and a generous donation from the M.R.& Evelyn Hudson Foundation. The authors would also like to acknowledge theefforts provided by Forrest Johnson in the design and fabrication of the ultrasoundtransducers used in this study, Trevor Hinshaw for conducting initial feasibilitystudies and development of the tissue-mimicking phantom, and Dr. Dawen Zhao and hisgroup for assisting with the acquisition of MR images. CB was the main generator of this manuscript. She was responsible for developing andcharacterizing the stereotaxic focused ultrasound system. She also worked as an operatorduring the animal experiments for this study. MW was the veterinary technologist andpreclinical coordinator in this study. She led the animal experiments involved in thisproject. She also contributed to the writing of the animal study section in thismanuscript. CRW, JMS, and JAR performed and analyzed the histological tissue sectionsproduced in this study. They also co-wrote the histology section in this manuscript. RCwas the principal investigator of this study. He came up with the scientific concept andoverall design for the study and reviewed the manuscript. He also supported thescientific work financially from existing grant support. All authors read and approvedthe final manuscript. This article is published under license to BioMed Central Ltd. This is an Open Access article distributed under the terms of the Creative CommonsAttribution License (http://creativecommons.org/licenses/by/4.0), whichpermits unrestricted use, distribution, and reproduction in any medium, provided theoriginal work is properly credited. The Creative Commons Public Domain Dedication waiver(http://creativecommons.org/publicdomain/zero/1.0/) applies to the datamade available in this article, unless otherwise stated.